Organizations can save significant dollars by improving the day-to-day management of their IT infrastructure. One way to do that is to achieve broad and deep visibility into application performance across the network with Riverbed® Cascade® Pilot and Cascade Shark. Cascade Pilot and Cascade Shark combine sophisticated, end-to-end monitoring with high-speed, high-fidelity packet capture and analysis to deliver comprehensive network performance monitoring and analysis. By continuously recording the packets traversing the network, rich troubleshooting details are always available, accelerating problem isolation and resolution times, and increasing productivity. 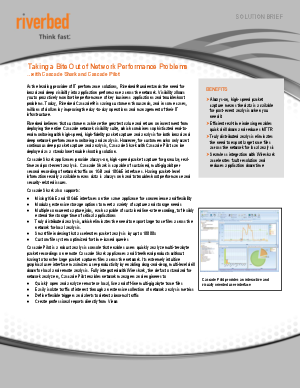 Download this solution brief to learn more.